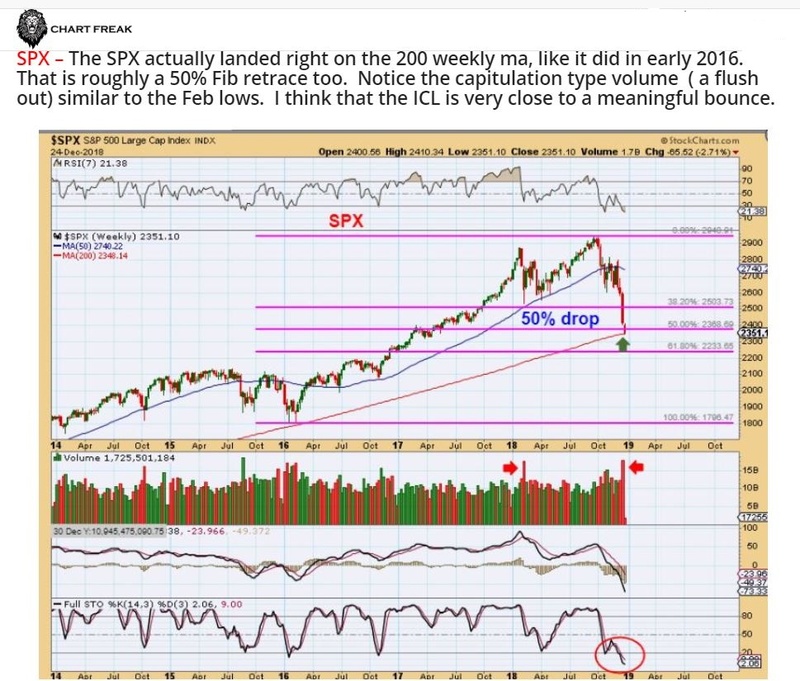 SPX - Capitulation volume came in on day 38, and that is good timing for a DCL/ ICL. The 3 day bounce is not even near 'Overbought". 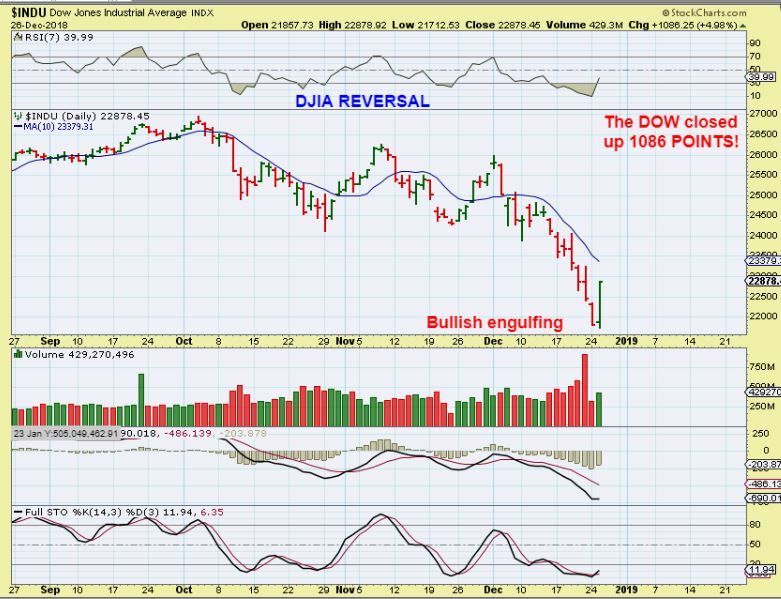 DJIA - I mentioned that it could be choppy or V-Bottom, but the lows should hold, so you can buy the reversal or buy it if it dips, with a stop under the new lows.
" When I look at the Equity Market Sentiment ( FEAR AND PANIC), and I look at the Puts Call ratio, I Look at the cycle count, the Fib #’s, The number of stocks trading below the 50 & 200sma, and a number of other things etc etc etc, it really looks like we are very close to an ICL. I will have to watch how the first 2 daily cycle play out from there, but a snap back rally seems overdue. A 1-2 month rally in the General Markets would also fit in with a pull back for Gold into the next Gold ICL." 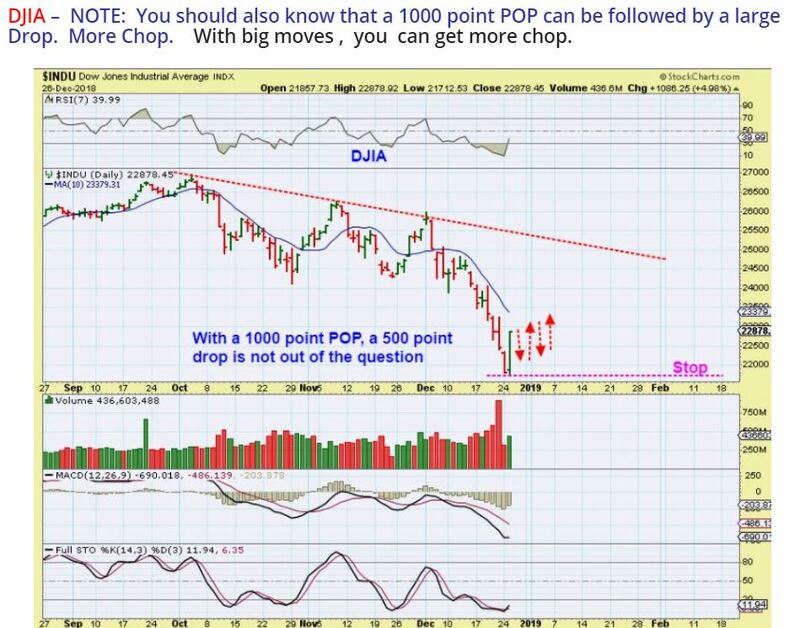 Wednesday, we saw the DJIA rally up 1000 Points! - Well, that sounds pretty awesome, but it does feel like the Dow has also been giving up about 600 every few days, so is this what we have been waiting for? Monday was only a 1/2 day of trading, and in my weekend I mentioned that I found something interesting pertaining to the Miners that I thought was important to share at this time, so I want to devote most of this report to that discussion. It has been reported that past week was the worst December in 10 years for the General Markets. I am hearing that depending on how it ends this week, it could even become the worst drop for the Dow in decades. This week I was thinking about the average person and their 401Ks. Why? I went to lunch with 2 friends on Thursday, and they said to me, " I saw the Dow was down 600 points! I know it'll recover, but wow, that is the 3rd time that I saw that recently. This is just normal sideways stuff, right?" Hmmm, Since October, the markets have plummeted and erased all of 2018's gains. 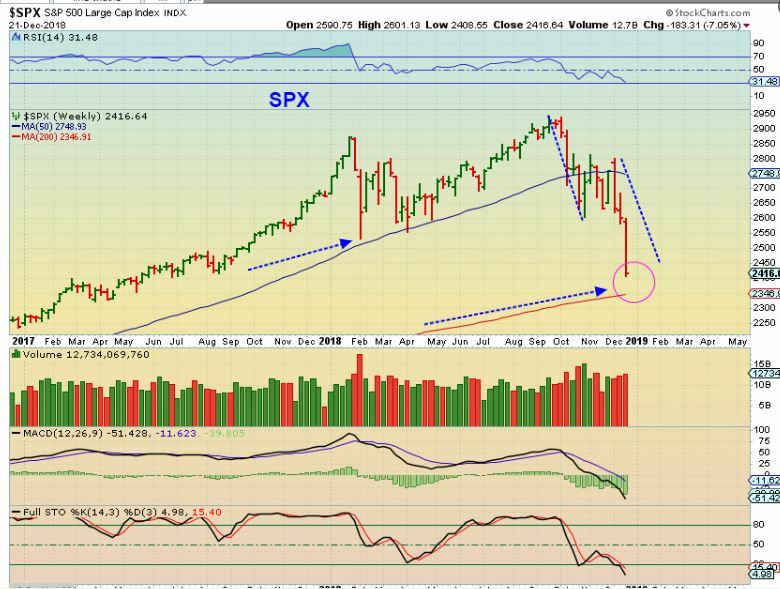 Even though most know that the markets are shaky or 'having a rough spell' as my other friend mentioned, I just realized that most do not know that the final quarter of 2018 wiped out all of 2018 and then some. Depending on how their 401k is set up, there may be an awful lot of shock when the next quarterly statement is viewed. SPX WEEKLY - You can see that last February -April, the sell off was steep, but this one has been 2x that drop. It is now approaching the 200 weekly ma as a possible support. This chart helped my friends to see that the last 3 months of 2018 may have wiped out their entire year of 401k gains and even half of 2017, depending on how they were set up. They were shocked and unaware, despite hearing about a few 600 point drops on the news. 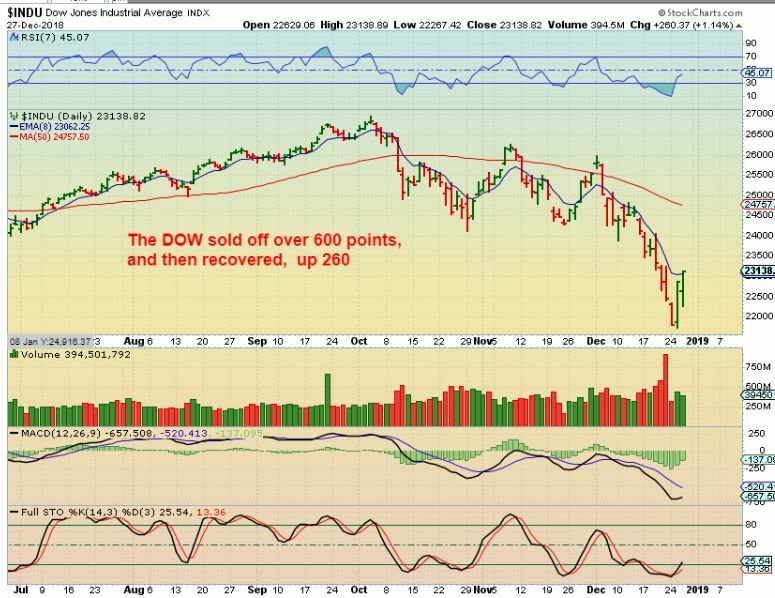 Well, it started to get choppy and difficult in various sectors a few weeks ago, and then we went into full sell down mode in October for the General Markets. Miners were sideways and choppy, forming bases but difficult to hold at times, and suddenly many of those bases have been breaking out higher. It has been a rough ride in the Markets, even the crash test dummies are complaining, but today is Friday, the last trading day of the week. SPX - This was my chart going into the FED WEDNESDAY. Day 34 Tuesday. SPX - This small candle with a new low on day 34 allows for a swing low with a move above Tuesdays highs (2573.99). 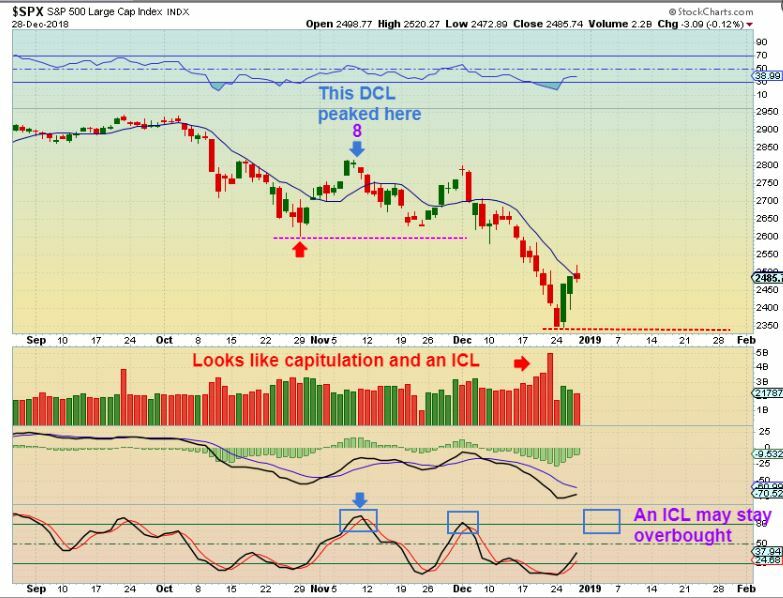 If the FOMC Decision changes the markets direction, it is possible that we will have a DCL & even an ICL. 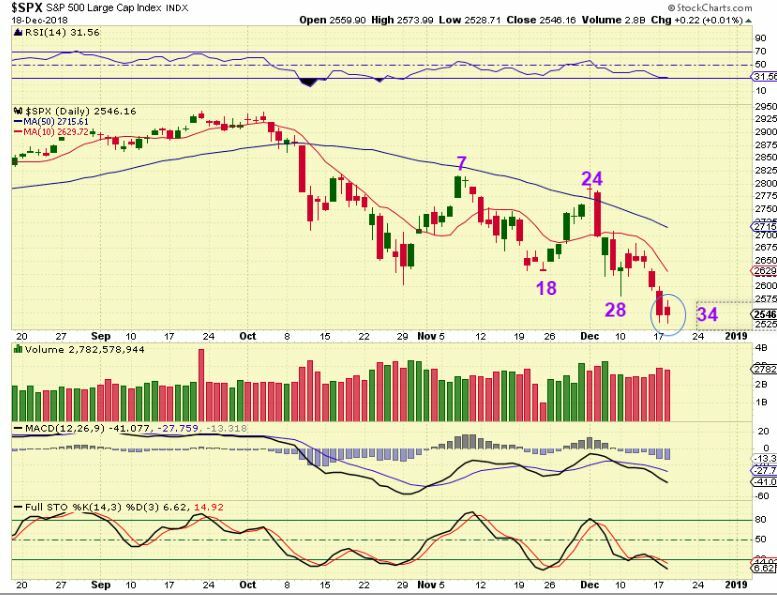 December 18th- No Market Turn Around (Yet)… FOMC Ahead? https://chartfreak.com/wp-content/uploads/sites/18/2018/12/Turn.jpg 663 711 Alex - Chart Freak https://chartfreak.com/wp-content/uploads/sites/6/2013/04/black_logo.png Alex - Chart Freak2018-12-18 11:43:212018-12-18 13:00:38December 18th- No Market Turn Around (Yet)... FOMC Ahead?